If you’re missing teeth, you have likely considered getting dental implants. However, you may have been unsure about whether they were the right choice for you. With alternatives such as a bridge or dentures, if you’re not familiar with the options, you may be left feeling uncertain about making a decision. Your dentist should be able to answer any questions you have about dental implants or direct you to someone who can, but it’s also important to do your own research. A dental implant is a cylindrical post that is placed into the jawbone and connects to a replacement tooth called a crown. The crown is custom made to match the look of your natural teeth. The implant will eventually fuse with the jawbone so that it becomes strong and sturdy. 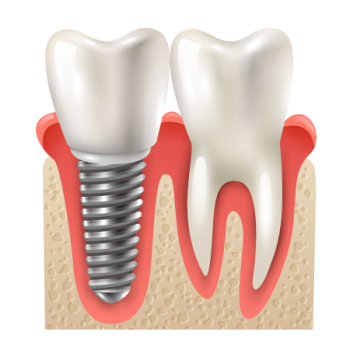 A dental implant is the closest alternative to a natural tooth. Who Can Benefit from a Dental Implant? Whether due to decay, disease, injury or a defect, if missing a tooth or teeth, anyone who is in good health and whose jaw has matured and stopped growing (around age 17), is a candidate for dental implants. There are some medical conditions which may interfere with successful implant treatment, so it’s best to be upfront with your dentist about any health issues you may have. Though dental implants are the most natural option for tooth replacement when all the natural teeth have been lost, there are alternatives, the most popular being dentures. Dentures can be appealing because they have a lower up front cost. However, dentures may not be retentive, they may slip or move when eating or talking, or may hurt when they are worn. Dental implants can be utilized to support dentures to make them very comfortable and stable. The combination of implants and dentures is a very cost effective way of supplying many lost teeth in one device. If properly cared for with regular good oral hygiene, dental implants have a high success rate of up to 98%. It is important to note that getting dental implants does require a surgical and restorative procedure. 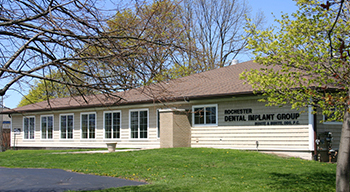 Therefore, it’s important to seek a dentist that is qualified to do both procedures. Certification by the AAID (American Academy of Implant Dentistry) and the ABOI (American Board of Oral Implantology/Implant Dentistry) shows the dentist is experienced in doing dental implant procedures.